Libraries can contain a huge number of Profiles, Fixups, Checks or even Variables and Actions. Various search options help to find certain elements easily. 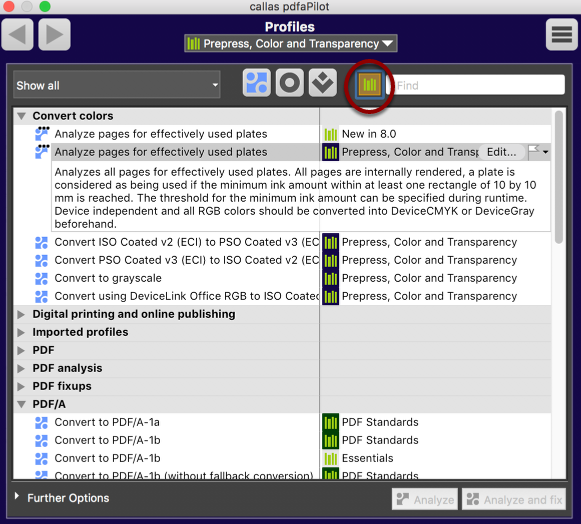 The illustrations show the related product pdfaPilot. 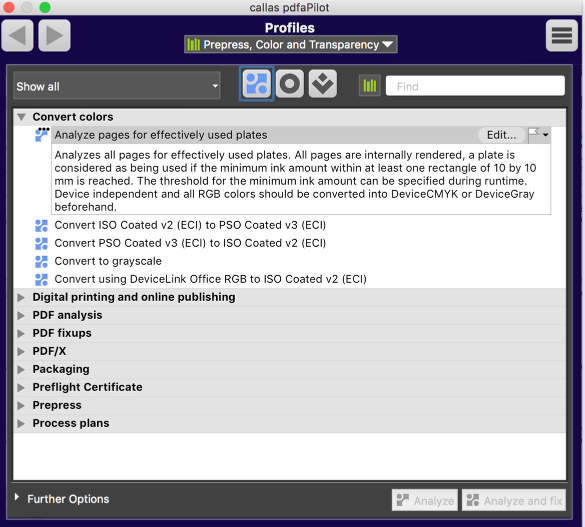 The functionality is identical to that of pdfToolbox. To search for Profiles, Fixups, Checks, Variables or Actions across the entire collection, use the 'Browse Libraries' menu item. You can access the function via Menu: Tools -> Search libraries. Alternatively, you can use the keyboard shortcut Shift-Command-F.
You can browse libraries using the menu button in the Profiles window. The Library to be searched can be selected from the pull-down menu. 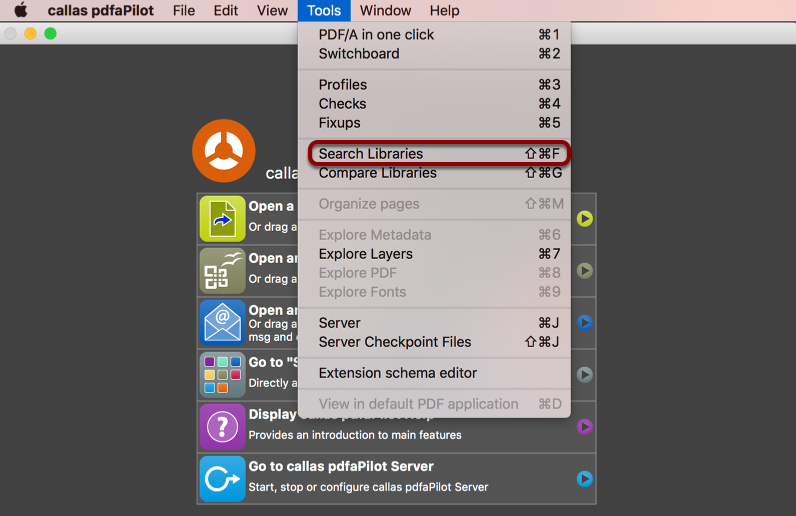 The 'Search All Libraries' checkbox is used to search across Libraries. Enter the search term under Name. As soon as you start typing, the first hits are displayed. You can also include the comments used in the individual profiles etc. for the search. 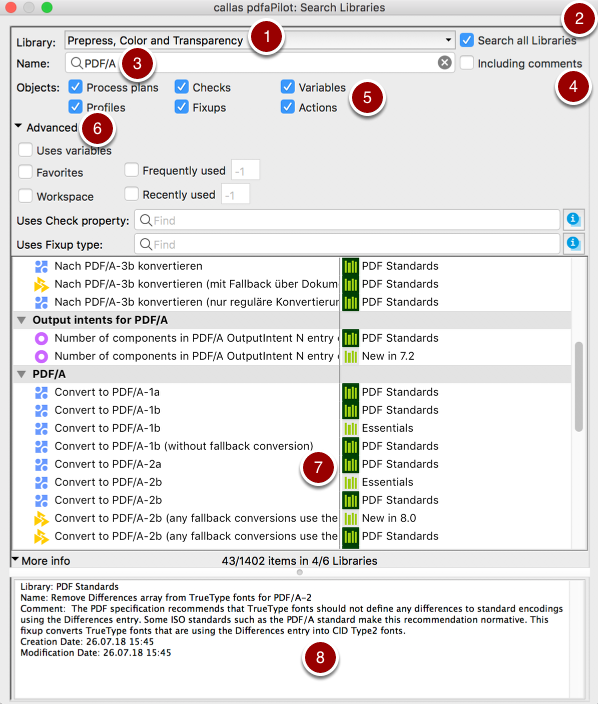 Under 'Objects', you can specify the search individually for Process Plans, Checks, Variables, Profiles, Corrections and Actions. Under 'Advanced', the search can be set in more detail (Favourites, uses Variables, Workplace as well as frequently or last used). The use of Check properties and Fixup types can also be taken into account. The hits are displayed in the list display, specifying the library. Under 'More info' you will also find the creation date, author and other info of the selected entry. You can also search in the windows for Profiles, Fixups or Checks. Only profiles that are in the currently selected library are displayed. If you want to search all Libraries, first click on the Library icon next to the search field. The search term in the "Search" field will be searched across Libraries.